Certain terms are used to describe the location of body parts, regions of the body, and imaginary planes by which the body can be sectioned. You should become familiar with these terms before your study of anatomy and physiology begins. Anatomical terms are useful only if everyone has in mind the same position of the body and is using the same reference points. Therefore, we will assume that the body is in the anatomical position: standing erect, with face forward, arms at the sides, and palms and toes directed forward, as illustrated in Figure 1.1. Anterior (ventral) means that a body part is located toward the front. The windpipe (trachea) is anterior to the esophagus. Posterior (dorsal) means that a body part is located toward the back. The heart is posterior to the rib cage. Superior means that a body part is located above another part, or toward the head. The face is superior to the neck. Inferior means that a body part is below another part, or toward the feet. The navel is inferior to the chin. Medial means that a body part is nearer than another part to an imaginary midline of the body. The bridge of the nose is medial to the eyes. Lateral means that a body part is farther away from the midline. The eyes are lateral to the nose. Proximal means that a body part is closer to the point of attachment or closer to the trunk. The elbow is proximal to the hand. Distal means that a body part is farther from the point of attachment or farther from the trunk or torso. The hand is distal to the elbow. Superficial (external) means that a body part is located near the surface. The skin is superficial to the muscles. Deep (internal) means that the body part is located away from the surface. The intestines are deep to the spine. Central means that a body part is situated at the center of the body or an organ. The central nervous system is located along the main axis of the body. Peripheral means that a body part is situated away from the center of the body or an organ. The peripheral nervous system is located outside the central nervous system. 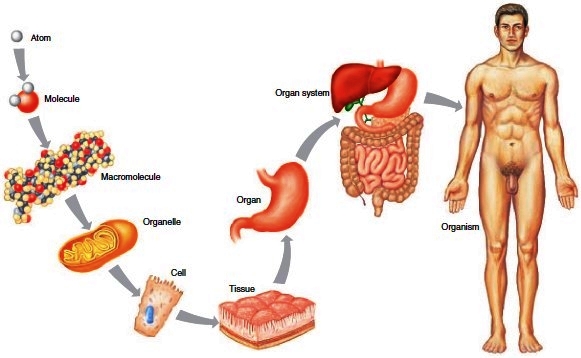 Figure 1.1 Levels of organization of the human body. Each level is more complex than the previous level. The human body can be divided into axial and appendicular portions. The axial portion includes the head, neck, and trunk. The trunk can be divided into the thorax, abdomen, and pelvis. The pelvis is that part of the trunk associated with the hips. The appendicular portion of the human body includes the limbs-that is, the upper limbs and the lower limbs. 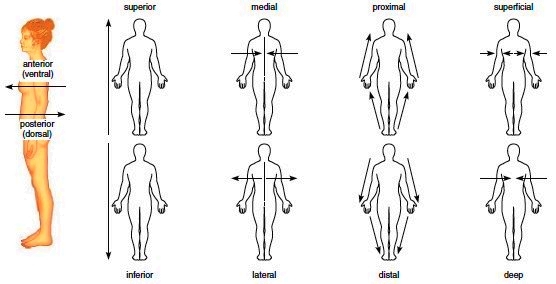 The human body is further divided as shown in Figure 1.3. The labels in Figure 1.3 do not include the word “region.” It is understood that you will supply the word region in each case. The scientific name for each region is followed by the common name for that region. For example, the cephalic region is commonly called the head. Figure 1.2 Directional terms. Directional terms tell us where body parts are located with reference to the body in anatomical position. Notice that the upper arm includes among other parts the brachial region (arm) and the antebrachial region (forearm), and the lower limb includes among other parts the femoral region (thigh) and the crural region (leg). In other words, contrary to common usage, the terms arm and leg refer to only a part of the upper limb and lower limb, respectively. Most likely, it will take practice to learn the terms in Figure 1.3. One way to practice might be to point to various regions of your own body and see if you can give the scientific name for that region. 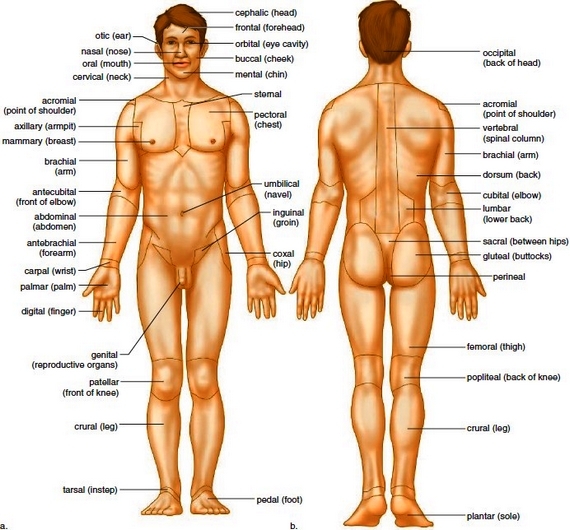 Figure 1.3 Terms for body parts and areas. a. Anterior. b. Posterior. The human body can be divided into axial and appendicular portions. The axial portion includes the head, neck, and trunk. The trunk can be divided into the thorax, abdomen, and pelvis. The pelvis is that part of the trunk associated with the hips. The appendicular portion of the human body includes the limbs-that is, the upper limbs and the lower limbs. The human body is further divided as shown in Figure 1.3. The labels in Figure 1.3 do not include the word “region.” It is understood that you will supply the word region in each case. The scientific name for each region is followed by the common name for that region. For example, the cephalic region is commonly called the head. Notice that the upper arm includes among other parts the brachial region (arm) and the antebrachial region (forearm), and the lower limb includes among other parts the femoral region (thigh) and the crural region (leg). In other words, contrary to common usage, the terms arm and leg refer to only a part of the upper limb and lower limb, respectively. Most likely, it will take practice to learn the terms in Figure 1.3. One way to practice might be to point to various regions of your own body and see if you can give the scientific name for that region. To observe the structure of an internal body part, it is customary to section (cut) the body along a plane. A plane is an imaginary flat surface passing through the body. 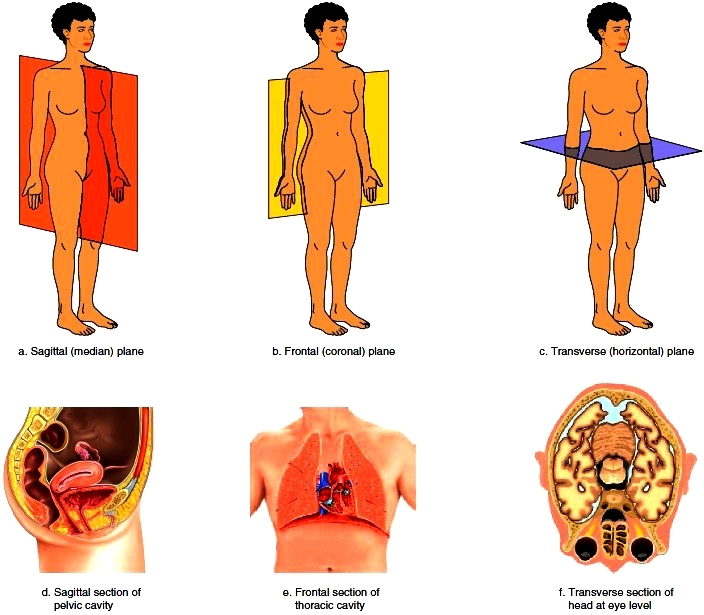 The body is customarily sectioned along the following planes (Fig. 1.4): A sagittal (median) plane extends lengthwise and divides the body into right and left portions. A midsagittal plane passes exactly through the midline of the body. The pelvic organs are often shown in midsagittal section (Fig. 1.4d). Sagittal cuts that are not along the midline are called parasagittal sections. A frontal (coronal) plane also extends lengthwise, but it is perpendicular to a sagittal plane and divides the body or an organ into anterior and posterior portions. The thoracic organs are often illustrated in frontal section (Fig. 1.4e). A transverse (horizontal) plane is perpendicular to the body’s long axis and therefore divides the body horizontally to produce a cross section. A transverse cut divides the body or an organ into superior and inferior portions. Figure 1.4f is a transverse section of the head at the level of the eyes. The terms longitudinal section and cross section are often applied to body parts that have been removed and cut either lengthwise or straight across, respectively. Figure 1.4 Body planes and sections. The planes shown in (a), (b), and (c) are typically used as sites for sectioning the body as shown in (d), (e), and (f).